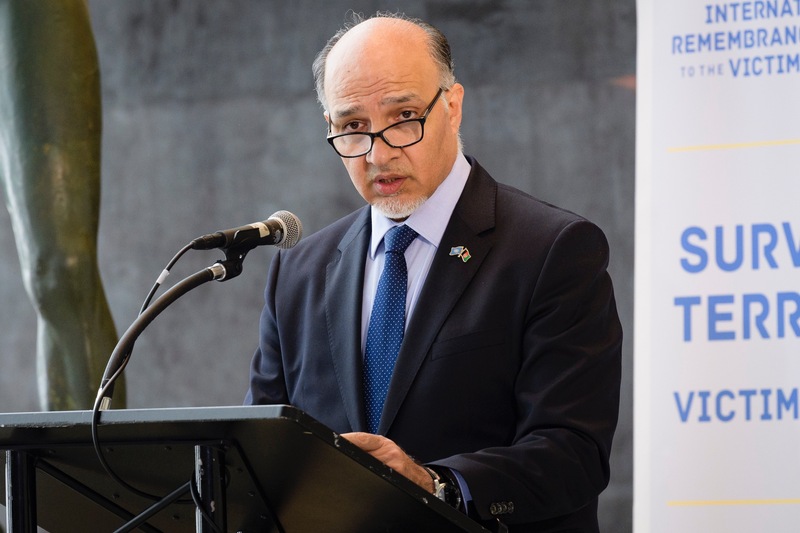 On behalf of the co-organizers of this event, the Permanent Missions of Afghanistan, Belgium, Iraq, Nigeria, the United States, and the UN Office of Counter-terrorism and Counter-Terrorism Committee Executive Directorate, I would like to welcome you all to this historic memorial and exhibition on the occasion of the first UN International Day of Remembrance of and Tribute to Victims of Terrorism. Mr. Secretary-General, you remember last year, on the 14th of June, you landed in Kabul- bravely! I say bravely because days before that, the most deadly terrorist attack in the history of our country had taken place in our capital. A truck full of explosives, driven by a terrorist suicide had gone off in the heart of Kabul, killing more than 150 and badly injuring over 550, almost all of them were civilians. The toll in Afghanistan has been rising with a new wave of terrorist attacks in the past two weeks. In recent years, the average casualty of terror in Afghanistan has been more than 10,000 a year- one third of them children. Similarly, the basic human rights, which is the right to life, of tens of thousands of people have been severely violated by terrorism around the world- in Asia Pacific, Africa, Europe, America, and in this beautiful city of New York. Most of the time, victims of terrorism are forgotten soon and are left to address their trauma and pick up shattered pieces of their lives by themselves. This is why last year, we initiated the resolution on establishing an international day to remember of and pay tribute to the victims of terrorism. 95 countries co-sponsored this resolution and it passed unanimously, for which we are thankful to all member states. We are also pleased with the focus on support for victims in the 5th review of the Global Counter-Terrorism Strategy. Beyond that, at the heart of our efforts, we need to address the root causes of radicalization, violent extremism, and terrorism; in particular their use in proxy wars. Mr. Secretary-General, you have been a good flag carrier of addressing these root causes. We believe you have the wisdom, courage, and justice to do that and in doing so, all of us are behind you.